Every operating system comes with a calculator that provides access to basic arithmetic functions and probably some additional ones like base conversions and some functions of a scientific calculator. They usually do lack some features like a history function in combination with an option to use results from history for new calculations. The Online Calculator eCalc comes in two shapes. 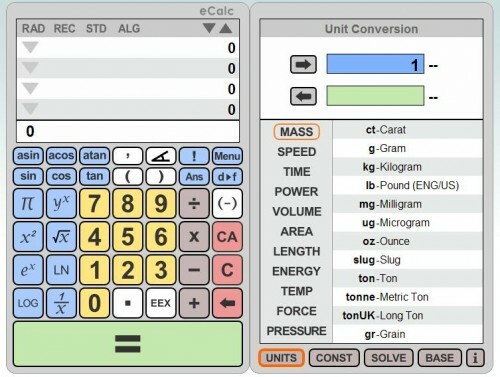 A basic and a scientific calculator. The basic one misses a lot of features like the history, conversions and scientific functions that are available in the scientific calculator. Both look colorful and can be used with the mouse only. Some chars can also be added with the keyboard. The calculator offers additional functions that cannot be found in the ones that ship with the operating system. It contains an impressive list of units that can be converted easily. If you ever wanted to convert carat into grain this feature is for you. The calculator does provide access to constants that can be used in the calculator, base conversions and an equation solver that is divided into an root and linear solver. I’m not using calculators that often and will most likely make no use of eCalc but it could be a nice online service for users who use calculators regularly.